I know the secret has been out for some time in the vegan world, but I'm just now in on it. Little Secrets are like VEGAN M&M's. Sorry for this weird picture. Yes, that is my foot. Sadly, I haven't seen these for sale in Memphis anywhere, which is why I'm late to the party. But I finally found them at Natural Grocers in Jonesboro, Arkansas — my hometown — over the weekend. One bite and I was immediately whisked back to 2004, which was the last time I had an M&M. I don't remember the last time exactly, but that was the year I went vegan. You don't always realize the things you're missing until you have them again, and that was the case here. I never pined for M&Ms (or any candy, really) the way I pined for mozzarella until Daiya and Miyoko's Creamery came along. But after a bite of a Sea Salted Peanut Little Secret, I was, like, dammmmnnn, I've missed that! 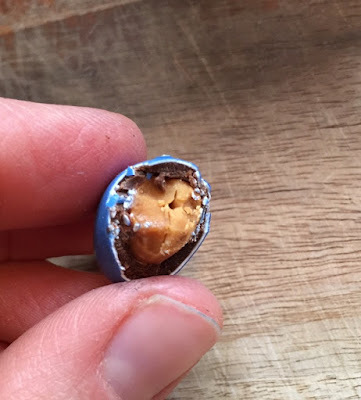 Inside that thin candy shell is a thin layer of dark chocolate encompassing a whole, salted peanut. I also purchased plain Dark Chocolate Candies. These are like regular M&M's. While peanut were always my fave, you can't go wrong with the classics. Not all of the Little Secrets flavors are vegan though. The raspberry ones are, and I'll definitely be trying those soon! But toasted coconut and peanut butter are not. Makes me sad because I WANT PEANUT BUTTER M&M'S. There's also a seasonal peppermint flavor that is vegan and a spiced pumpkin pie flavor that is NOT vegan. Okay, see y'all later. I'm gonna go stuff my face with candy now. Btw- i saw vegan "better than butter" at the store today! I don't think i'll ever change my loyalty to earth balance, but i love that mainstream companies are developing more vegan products! The raspberry ones are so good! I remember I bought a bag of the peanut butter and was so disappointed to get home and find out they're not vegan. WHY!! Luckily Natural Grocers let me exchange them. I need to try the peanut I've only had the dark chocolate and the raspberry. I'm so excited to know that these are good! I know I've mentioned that I've seen these at my local grocery store but never bought them. I'm going to have to give them a try! I'm so excited about the peppermint ones during the holidays! Yassss! These are my FAVORITE. I literally just wrote "Little Secrets" on my grocery list. Cadry sent me some of the regular ones and they were SO GOOD! Hopefully I can get my hands on the peanut ones and the raspberry ones at some point. We only have those Nonos ones here, but they are expensive (imported vegan product mark up) and not that impressive. Their FAQ says they can't call them vegan because they don't know where they get the sugar. I'm torn on whether to eat them now. I had them before. The raspberry ones were my fave!! BTW if you find Endangered Species bark with peanuts, buy it!! It's really good.